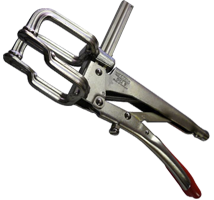 We carry a full range of Bessey SuperGrips pliers. Bessey SuperGrips pliers are helpful in griping metal work-pieces that may be too hard or impossible to grip any other way. Our Bessey SuperGrips pliers will remove much of the difficulty out of any metalworking project and will withstand the rigors of everyday usage. Please take a look at the full line of high quality Bessey SuperGrips pliers below.